Tibet, often referred to as the ‘roof of the world’ or the ‘world’s third pole’ because it contains the biggest ice fields outside of the Arctic and Antarctic, is threatened by melting glaciers and other extreme weather phenomena. 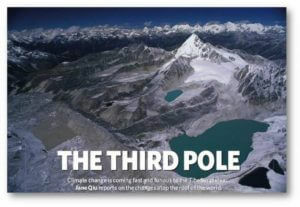 Scientists believe that the Tibetan plateau offers an early warning of global climate change. Because Tibet is the source of several of the world’s largest rivers and plays a prominent role in the Asian monsoon system, the consequences will affect the lives of millions of people downstream as well as those on the high plateau. According to scientists, the Chinese government’s land-use policies of fast-track urbanization, infrastructure construction and resource exploitation are contributing to the acceleration of global warming and environmental destruction in Tibet. Tibet’s harsh and rugged climate masks a fragile ecosystem that is vulnerable to the effects of global climate change—studies have found the effects of global warming more pronounced at higher elevations. 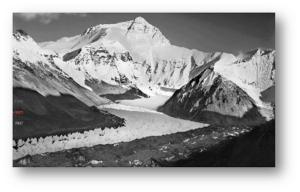 A 2007 study by the Tibet Autonomous Region (TAR) Meteorological Bureau found that the TAR is experiencing a 0.3°C increase in temperature every decade, over twice the global average, with four of the five warmest winters in the last 35 years in the TAR occurring since 2000; while the past century has been the warmest in 1000 years. Today, China as a whole is experiencing a 0.4°C rise every 100 years. 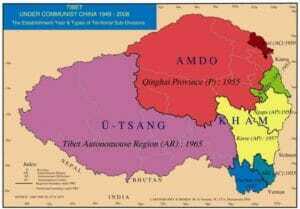 Scientists believe that in Tibet as elsewhere one driver of climate change may be land cover and land use changes relating to agriculture and urbanization. These factors may even outweigh ‘greenhouse gas forcing’. “The many civil engineering projects currently underway, such as the construction of the Qinghai-Xizang railroad, combined with a conscious effort by China to urbanize the Tibetan plateau, will lead to further and likely greatly accelerated population increases and land surface changes in the future,” said scientists Oliver W. Frauenfeld and Tingjun Zhang. “According to some studies, the carrying capacity of parts of the Tibetan Plateau has been far exceeded, partly due to inappropriate land management practices implemented in the 1950s. Greenpeace predicts that if current trends continue, 80% of Himalayan glaciers will be gone in 30 years. 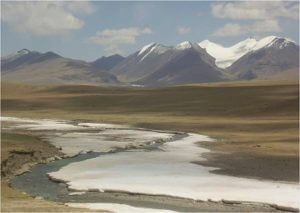 Scientists predict that the land cover on the Tibetan plateau will significantly change due to global warming. 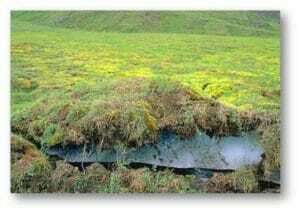 While glaciers and permafrost melt, areas covered by natural vegetation could expand; be making more land available for farming and be raising livestock. However, the mismanagement of expanding farming and pastoral areas, coupled with the increased chances of drought due to climate change, could instead result in increased desertification. Environmental problems on the plateau are compounded by a greater demand for water in the region on account of rapid development connected to the railway as well as an amounting influx of tourists and visitors. Since the opening of the Qinghai-Tibet railway, the TAR has experienced acute water shortages. Climate change impact on Asia’s water resources. The immediate effects of global warming can be found in Tibet’s shrinking glaciers. The Tibetan plateau’s high-altitude location once maintained 36,000 glaciers (covering wetlands has dropped due to increased evaporation caused by global warming, a total area of 50,000 square km), but they have shrunk by an estimated 30% over the last 100 years. If current warming trends continue, glaciers 4 km in length and shorter are expected to completely melt with a 3°C increase in temperature, dramatically decreasing Tibet’s glacier cover. This includes a 60% decrease in the glaciated area at the headwaters of the Drichu River (Yangtze River), Asia’s longest. The melting of glaciers means more flooding in the short-term and more droughts in the long-term. Liu Shiyin from the Chinese Academy of Science’s Cold and Arid Regions Environment and Engineering Research Institute was quoted by Xinhua in July 2007 as saying that “the shrinking of glaciers has picked up speed in the past decades. While there might be more water in the rivers at present because of the increased melting, in the long run, the glacier water will decrease, and droughts will follow”. Changes on the Tibetan plateau are crucial for the water resources (irrigation, drinking and hydroelectric power) of most of the Asian continent. A United Nations report found that half the world’s population is dependent upon water from the Tibetan plateau and the Himalayas, where the Yangtze, Yellow and Mekong rivers also rise. 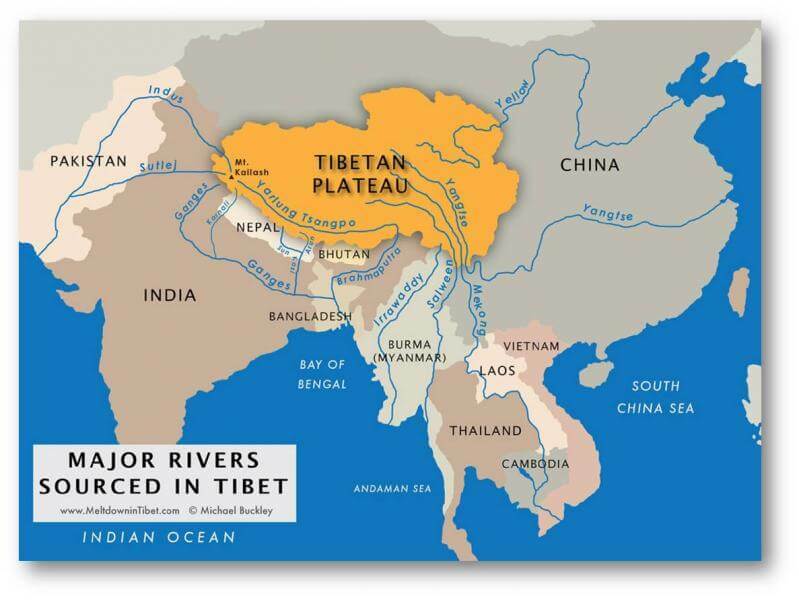 The rivers originating on the Tibetan Plateau, which include the Yangtze, Yellow, Mekong, Brahmaputra, Indus, Karnali, Sutlej, Irrawaddy, Salween, and the Arun, feed 11 large deltas that have formed along Asia’s coastal zones. Any change in the water level and supply of these rivers would affect millions of people dependent on these waters. There is an increasing concern in countries downstream (notably India) about the impact of China’s accelerated development policies on water resources, as well as the implications of proposals for dams and water diversion projects on the plateau. An Indian analyst commented with concern on plans for a water diversion project impacting the Brahmaputra, intended to address China’s shortage of water, and which may go ahead in 2009. “The existing barrage on the Sutlej river and the planned structures on the Brahmaputra have the potential to control river flows into India,” explained M.S. Menon, a former member secretary of the Indian National Committee on Irrigation and Drainage, in an article in the Indian press. Menon pointed out that several years ago, for instance, floods from the Tibetan Brahmaputra devastated many parts of Arunachal Pradesh, and that the flow patterns indicated dam failure. “Though China denied it, satellite imageries confirmed broken structures,” he said. Climate change has also been cited as one factor contributing to the shrinking of wetlands at the source of the Yellow and Yangtze Rivers, reducing the amount of water that flows down the rivers. China’s state-run news agency, Xinhua, reported on research by scientists from the Institute of Mountain Hazards and Environment at the Chinese Academy of Science (CAS) who studied the Tibetan plateau’s wetlands over a 40-year period and found that they have shrunk by more than 10%. The wetlands feeding into the Yangtze River alone have been reduced by 29%. Despite increased rainfall in the region, the water level in the wetlands has dropped due to increased evaporation caused by global warming. 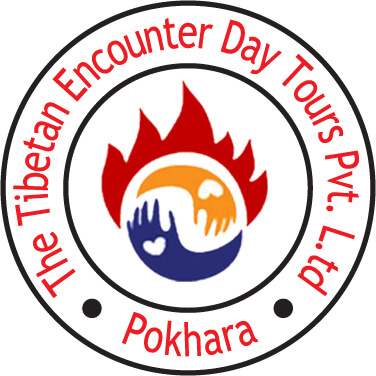 Interested in learning more about Tibet?